Robotic Process Automation (RPA) can be highly effective in automating repetitive tasks that might consume valuable employee work time. Here are 5 key characteristics for identifying which processes would benefit from RPA implementation. Topics about Artificial Intelligence (AI) are often framed in dystopian ‘man vs. machine’ extremes. One such AI process is Robotic Process Automation (RPA), used by the world’s leading firms to streamline systematic operations in the workplace. As a human-led automation process, however, RPA is neither the downfall of human capital nor the revenge of the robots. 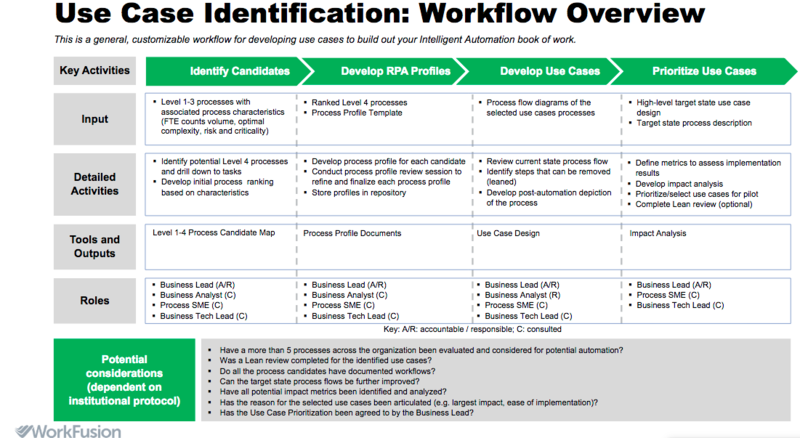 RPA tools imitate human decisions when executing vital business tasks in an optimized workflow. The real value of RPA lies in a strategic collaboration between employee direction and automation software. This article will briefly explain business processes that have profited from RPA in daily operations. Unlike Business Process Automation which completely transforms how work is executed, RPA accelerates workflows that already exist. Within a company’s operational infrastructure, leadership needs to identify repetitive, rules-based and measurable tasks to automate in accordance with core competencies. In RPA, users configure the software to create virtual agents or “bots” that execute the desired transaction or task. Within seconds, bots can increase throughput conducting upwards of 20-step sequences using business logic in an intelligently automated value chain. Transactions can vary in complexity from generating a single return policy to thousands of coordinated bots in CRM/ERP applications. Like a micro task-army, bots need clear instructions to complete operational missions. There’s a reason why writing hundreds of lines in school was a punishment - nobody enjoys spending time on repetitive tasks. Instead of punishing our workforce, bots can observe how full-time employees (FTEs) operate by registering user events, observing variables and scraping data. Repetitive processes can be coded, sequenced and scaled without error. Using Machine Learning, RPA tools can recognize similar inputs, forecast workflows and improve task execution based on previous identification errors. Operational rules like Standard Operating Procedures should be the first to be automated as they steal productive time from employees. Unlike limited human capital, bots can execute high-volume decisions up to 15 times faster than humans. Web-based RPA systems act as an automated assistant, quietly and autonomously processing tons of work that doesn’t require human intervention. This allows companies in a digital transformation period to scale efficiently. Traditional IT structures must be leveraged to simplify bot instructions where possible. Once automated by RPA, low-value tasks can be configured in a conditional pathway, using “if not this, then that” decision trees, that are easily understood across the organization. The applications to which RPA is applied must be relatively stable to avoid excessive and costly modification. To prevent a chaotic network of incongruent bots, business sequences should be traced to expected responses and integrated digital systems. RPA tools act as an orchestration tool between multiple systems and third -party APIs. RPA integration is advantageous in scenarios where API source codes are not available. CIOs must select RPA software that enables a unified experience and therefore heightened productivity. After business operation processes have been identified, RPA bots are ready to be deployed into daily operations. Workflows that can be enhanced by RPA are cost-effective activities that affect potential revenues. A common illustration of workflow disruption is the automation of clerical tasks like data entry and email management. When emails with various types of attachments arrive, the bot extracts data from and sorts the information according to the performance rules it was assigned. This information is then categorically transposed into a row on a master excel sheet while the original file is saved in the machine. As this task is completed, the bot uses its assigned credentials to log into an enterprise web application that registers data from each excel record. The bot creates new invoice reports, completes compliance forms then sends out an email confirming process completion to the relevant human supervisor. Businesses are increasingly using RPA for cognitive applications like speech recognition and natural language processing. In this context, a chat bot is prompted to make queries or resolve standardized issues. Cognitive RPA functions have enormous potential to improve customer experience. Processes like bookkeeping, cross-section invoicing and expense management are the regular kinds of tasks RPA developers envisioned in automation. In AR/AP, for example, bots can provide audit trails and strengthen supplier relations with faster payment. RPA systems can be programmed to calculate tax and transfer prices to billing procedures. Similar to the financial management departments, HR systems continuously monitor personnel on multiple levels and calculate benefits. A seemingly obvious application of RPA, IT automation influences how employees address wider systems management. IT-specific processes may include support for technical problems, password resetting, and data backup. However, whenever a systems gateway like a password is changed, employees must be sure to configure any related bots in the value chain. Across an enterprise, RPA is used to gather data and analytics in multiple department applications. Automatically generated reports on process efficiency, usage and costs can help employees make better decisions with accurate information. Nevertheless, with great power comes great responsibility. While it may be tempting to gather as much information as possible, companies must observe regulations regarding privacy and data compliance. 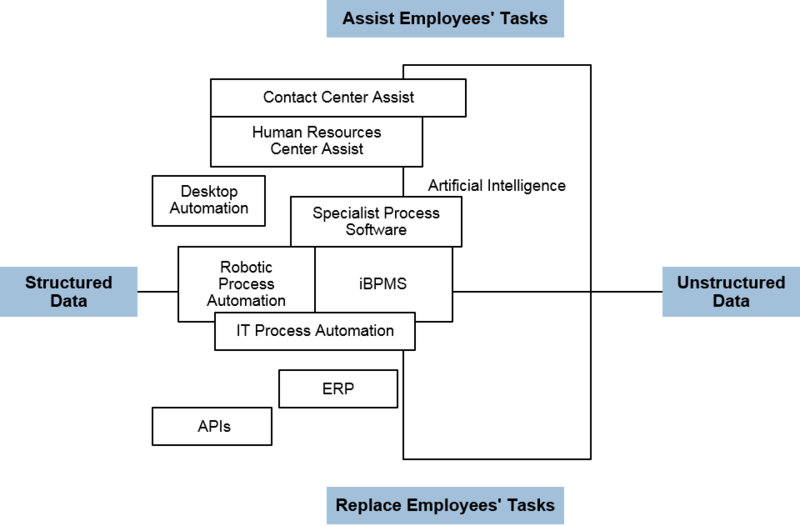 While a human-RPA strategic partnership is ideal, automation is often used as a reason to eliminate labor. Admittedly, RPA can reduce future staffing costs by minimizing overall waste, but FTEs cannot be easily replaced with automated functions. Knowledgeable workers that intimately understand business processes, will organize rules and define corporate sequences central to AI. Moreover, many RPA strategies fail without that central human decision-making element. CIOs, COOs, and related FTEs need to cooperate in a structured project to implement RPA. Why invest organizational human capital in a couple of bots? It’s estimated that RPA systems can yield an ROI of between 30 and 200% in the first 12 months when applied effectively. Regardless of a company’s size, industry or software exposure, RPA tools add value by increased accuracy, speed and flexibility. Though bots imitate human activity, they don’t respond to minor changes in UI or data like humans can. Without proper insight and application, companies might miss the true potential of RPA as a tool designed to alleviate negative stress for employees. The automation of low-value tasks relieves workers of time-consuming housekeeping duties so they can focus on higher value work with clients. When businesses choose which processes to automate with RPA, it’s vital that talent management is balanced with AI.